Performers include: Robin Williams, Pam Dawber, Conrad Janis, Ralph James, Elizabeth Kerr, Robert Donner, Tom Poston, Jay Thomas, Gina Hecht, Jeffrey Jacquet, Jim Staahl and Amy Tenowich. 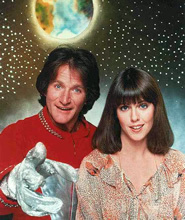 Journalism student Mindy McConnell (Pam Dawber) has a mild-mannered life until she meets a wild alien named Mork (Robin Wlliams) who has come from the planet Ork to study Earth. After some coaxing, Mindy promises to keep his true identity a secret and lets him move into her attic. This outrages her conservative record store owner father Fred (Conrad Janis) but her hip grandmother Cora Hudson (Elizabeth Kerr) is more accepting. Other characters included African-American teenager and Cora’s music student, Eugene (Jeffrey Jacquet); deli-owning siblings Remo and Jean DaVinci (Jay Thomas and Gina Hecht); grumpy neighbor Mr. Bickley (Tom Poston); childlike Mearth (Jonathan Winters), and eccentric Exidor (Robert Donner). The series is a spin-off of the sitcom Happy Days. R.I.P. Robin Williams. No one could have ever played Mork like you. Please make new Mork & Mindy back on the air. As far as I know the final episode aired was part one of a two parter that involved a hostile invasion led by Mork’s buddy from Ork who turned out to be a bad guy. The episode ends with a preview of part 2 that showed Mork at the white house. When I tuned in the following week, Mork & Mindy had vanished without a trace. Was the second part ever aired? @TYancy: The show ended with a three-part episode that ended with Mork and Mindy traveling through time. It was never resolved unfortunately.